Sometimes, the best and only way to unwind is to pop open a bottle (or can) of your favorite beverage, dim the lights a little bit (or light up a candle or two or twenty), and fire up some Bob Ross videos. Yes, you heard me right. It’s incredibly soothing to watch the prolific painter of all things happy work his craft, whether you’re unwinding from a tough day at the office, bored on the weekend, or recovering from the world’s worst hangover. 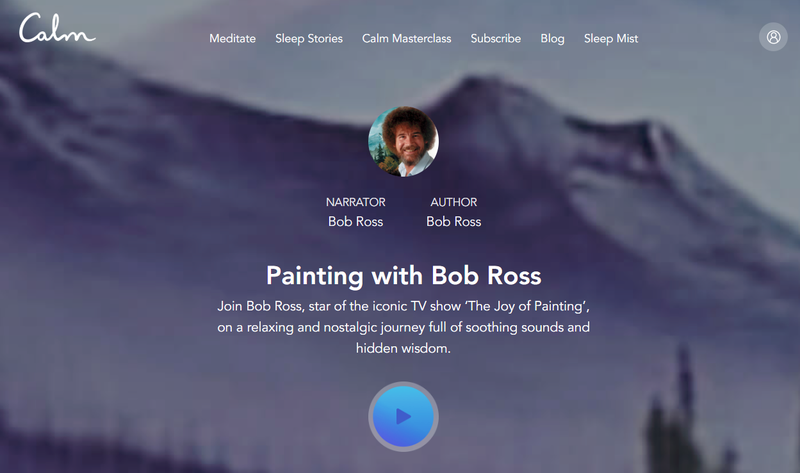 And while it’s easy to get your Bob Ross fix on YouTube or Twitch (if you really want to marathon through snowy or tree-covered mountains), I was delighted to see that the meditation app Calm recently decided to worship at the Church of Ross as well. Calm, for those unaware, is a subscription service—available on the web, iOS, and Android—that you can use to meditate and relieve stress through weekly guided sessions or soothing stories that aim to calm your frantic mind before sleep. 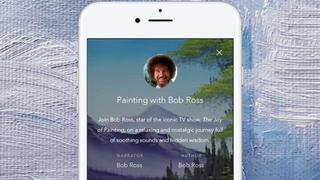 And it’s in these “sleep stories,” as Calm calls them, Bob Ross finds a new home. Thankfully, you don’t have to pay anything to give Calm (and Bob) a try. The service comes with a seven-day free trial, and you won’t be billed for a monthly ($13), annual ($60), or lifetime ($300) subscription as long as you don’t forget to cancel it before the trial runs out. To experience Bos, just go here once you’ve set up your free trial (or if you’re an existing subscriber). Click the big play button and it’s off to the forest/wilderness/landscape of your choice, without any of the stress that comes from actually using his advice to attempt a painting of your own. I find it a bit more calming to just slap on one of the service’s guided walkthroughs and let ‘er rip when I’m trying to unwind, but hearing Bob Ross beat the devil out of a brush, as he puts it, is also satisfying. Heck, he could read the names of colors all day long; that, in itself, might encourage me to finally take that nap I’ve been putting off. Mmm. Phthalo Blue.